a. This is where the threaded plastic baffle is screwed in. This is the port where water to be treated enters. b. This is where the double aeration tube is screwed in. It is the port where air enters the tank. It will be left unused if your unit does not have the double aeration feature. c. The smaller unthreaded hole is where excess air is vented from the air tank. Push in the smaller diameter tube (the square-cut end goes into the hole). d. This is the port where treated water leaves the tank. 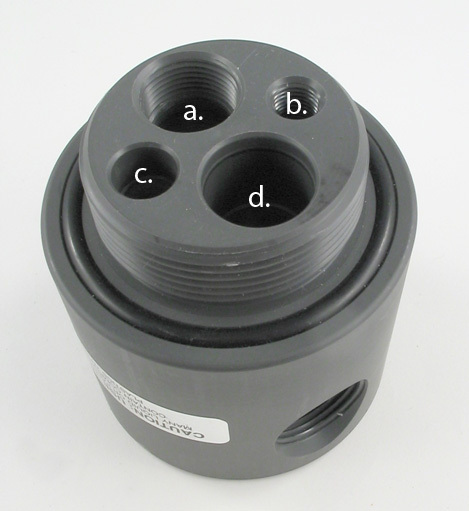 Note that it has an O-Ring. Push the larger tube as far as it will go into the port.